We recently published an article on FreshPlaza, about handling and delivering empty cartons in fruit packing facilities. Everyone knows that this can be a challenge given the fact cartons need to be transported from the carton forming area to the packing area. 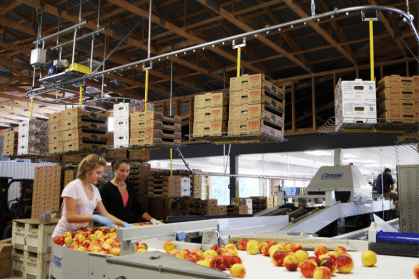 The fruit packing operation mentioned in the article used the PAC-LINE™ overhead conveyor system to address the problem of congestion and transportation of cartons. The overhead system was used to move empty cartons to and from different areas and ended up reducing the labor costs of the operation! The PAC-LINE™ system can be set up to take virtually any desired path, whether it is up, over or around existing equipment or just getting from one area of the facility to another.Therefore this system can be tailor fitted to various needs and may even be perfect for your operation. Check out our NEW video that features apple and peach packing empty carton delivery to get an idea of how to improve efficiency in your fruit packing operations. Click Here read the full Pacline press release.